Thank you 2011, Very Cool! Trust me, as and attendant on a school bus, they are much safer without seatbelts on, if ever there was an emergency trying to get 40 kids who are freaking out out of seatbelts and safely off the bus would be impossible. The seats are designed to protect the students in case of a crash anyway. @PineapplesForDays, how? The buses in Australia, the back is metal and if the bus crashed head on, I'm sure people would injure themselves on the metal backing. Also there are multiple metal poles to crash into as well. @hasher2288, in the usa school buses have softer backs. @PineapplesForDays, crap. 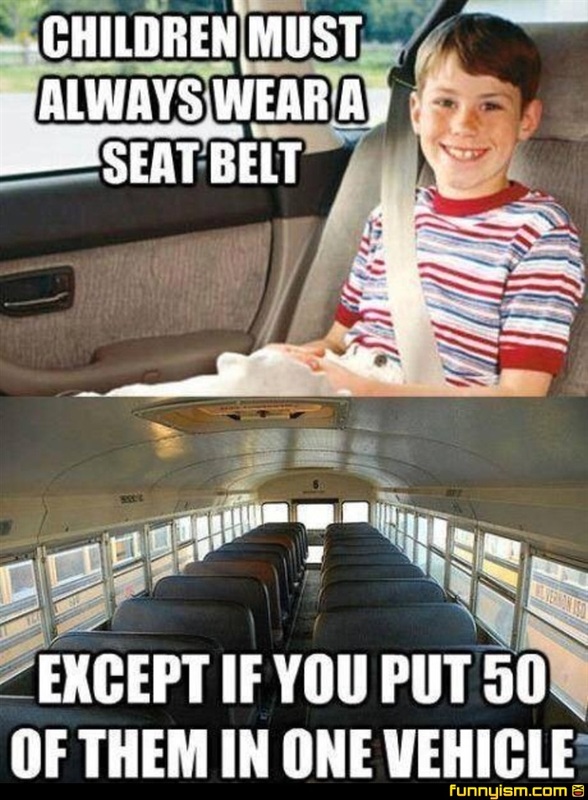 Sorry, the only reasons there are no belts are saving money, and also, if the bus was forced to stop when a belt was taken off, the bus would go no where from kids undoing belts just to be funny. @DOCTORx1963, so a clam shell that folds down on the children sitting on them? @DOCTORx1963, what if they brace, are larger (I’ve had to have a seat to myself since 5th grade), or don’t fly forward for any number of reasons? @DOCTORx1963, the point of my size question is not that size doesn’t affect the inertia, it is that for some people, myself included, there is nowhere to go. I’m 6’6” and heavily built (also, yes, a lardball, but that isn’t really relevant). I have to sit sidesaddle and still can’t fall forward out of the seat. @Ribird, the real answer, as far as I can find online, is that the seats don’t fold forward because that would be stupid. Looks like this meme has come around again. By people who don’t understand why seatbelts on a bus is a very bad idea. This meme comes back around every so often. And every so often we have to explain it to the children new to memes why this is a bad idea. Because thats the only reason this meme would resurface every so often. Because its children new to memes thats never seen it or dont spend that extra second it would take to think about why. After several decades. Safety experts have continued to say that seatbelts shouldn’t be on the bus. So does that mean 50 children equal 1 adult?